I do a lot of writing. I write historical fiction, wiki articles, two blogs and I review for the Australian Women Writer’s Challenge but this is my greatest challenge of all! Writing a poetry review! For me good poets perform amazing feats with words. They turn words on their heads. They use everyday, simple words to conjure up a feeling, a moment, a view, a host of things that we often don’t associate with those particular words. 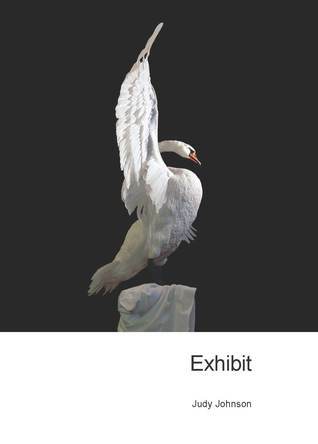 They arrange them on the page and suddenly the words take flight - such as the swan on the cover of Judy Johnson’s wonderful poetry collection - Exhibit. How do you review that? How does someone choose their own words to describe a feeling that another person has evoked so originally? I think it is an impossible task and I’m not really going to try. All I can do is chose some of the elegant and evocative sentences that Johnson has assembled on the page and invite you to step into her world. This poetry collection is bi-lingual with Judy’s poetry on the left side of the page and the translation of the poem by Iris Fan Xing on the facing page. Many of the poems feature ancient landscape - “Celtic Fort” (County Monaghan) and “The Burren” (Galway Bay, Ireland). These poems are very effectively juxtaposed with those of the more personal - “Thirty Four Years On” and “Light and Skin”. Many poems fall between these two poles seamlessly.Here are some of my favourite lines:“The child on the swing is in aweof the lightness of her balanceand the park’s geometricwild promises of sky.She has chained herself willinglyto an immense blue heightand pushes out her small boatwith only a pair of polished shoes as anchor.Her body for thesebrief rocking momentsis a time machine.”Wonderful! And this from “Walking Nobby’s Breakwall”” “The breeze is a tide of waterless liquidrolling up, unrolling its prayer maton the skin of my arms. The smell: crabs boiling in seaweed vinegar.” And from my favourite poem “Photography at Dingo Creek, 1967”“...All the care it had taken to trap her in the infinitesimalshutter speed wink between the moment and the moment’s loss.”Highly recommended! Judy Johnson - Judy Johnson has published four poetry collections, a verse novel and two chapbooks, a novel with another forthcoming in November 2014.She has won many prizes for poetry including the Victorian Premiers award, Wesley Michel Wright Prize twice, Josephine Ulrick and Val Vallis award and been shortlisted in many others including the West Australian Premier's Award.